Our Mission Driven Model is designed to move people from prospects to customers; from customers to raving fan customers; from raving fan customers to reps; and from reps to reps with goals! Many new team members will come from your customer base so it’s important to share with 2 new people per day to continue adding customers. Customer care is so important! 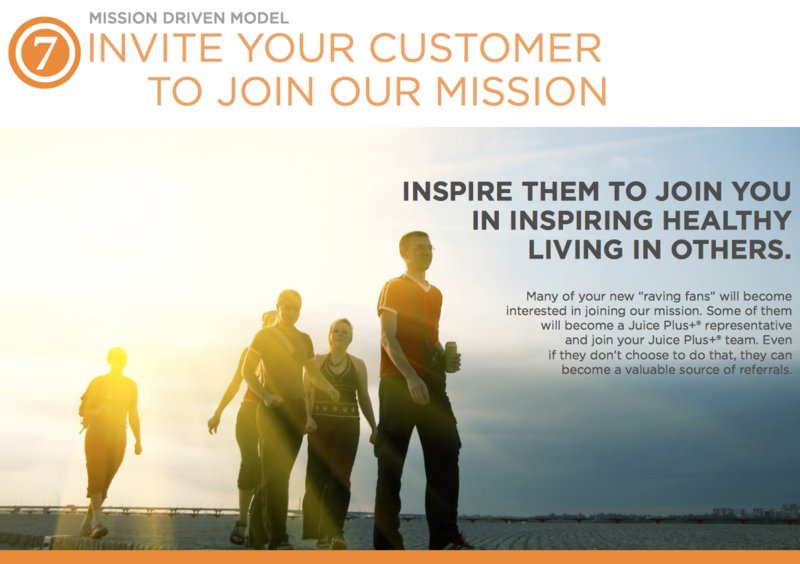 Raving fan customers often begin naturally sharing Juice Plus+ with others and eventually become team members. However, some prospects will see the value in becoming a customer and a representative at the same time so not everyone will be a customer first. This often happens because Juice Plus+ immediately makes sense to them and they see value in sharing it with others. Sometimes they are interested in offsetting the cost of their own Juice Plus+ by sharing it with others (Friends & Family). So how do we easily invite others to join our mission of Inspiring Healthy Living Around the World? I had a wonderful experience with Juice Plus+! I naturally started sharing it with others. I decided to join the mission of this company which is to Inspire Healthy Living Around the World. Work on your Business Story with your sponsor. Invite them to a 3-Way Call with your NMD. Ask if you can send them a Business Video. See OnEaglesWings.tv. Invite them to a Business Event (ask your sponsor). Share the simplicity, strength and longevity of our products. Share the simplicity, strength and longevity of our company. This profile will build your belief in who we are and why you decide to represent Juice Plus+ – essential to effectively sharing your Business Story.